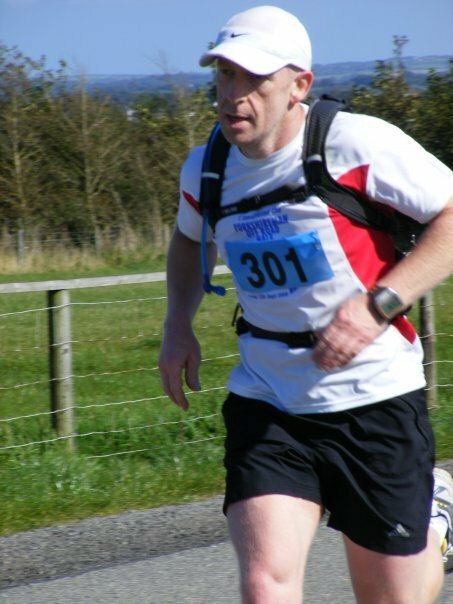 Race Report “Anglesey Marathon” 20th of September 2009 « Shuffling Along . . . . .
We set off for Anglesey at 5am to reach the show ground where the marathon was to be held at 8am, when we arrived the sky was clear and it looked like a nice fine day was to follow. The show ground was a little uninspiring with a large car boot sale on at the same time as the marathon, half marathon & 10k races. I registered and got my number (301) & my Champion-chip as the race was to be electronically timed. The organisers announced the race would be postponed but later said the original time would be held. We lined up for the start & were counted down in both Welsh & English. We ran out of the show ground and onto the road, most of the roads were still open to traffic & this would mean us having to run the majority of the race in single file. I was doing this marathon as part of my training for the 870 mile JOGLE race in 2010 so I didn’t push very hard to avoid injury, sometimes its better to look at the bigger picture and back off a little in training. I intended to finish in around 4-4:30 this pace is nice & easy and makes the race enjoyable rather than a chore. After a mostly uneventful first 10 miles of a quite undulation course it was getting quite hot and hilly & we were approaching a section of the coast road which was nice as the cool air from the sea was a nice rest from the sun, the course had offered little in the way of shade. I didn’t read the race info as I always take a Camelback & my own water supply and food on most of my training runs so as not to be reliant on the race organisers, I learned this the hard way a few years ago at a race where the water & gels had been put out for the race the following day then stolen in the night! My Camelback held 1.5 litres of water and some electrolyte, I’d also collected 6 high five gels before the race started which I would eat every 5 miles, I don’t usually like gels and much prefer proper food on my runs but on this occasion I didn’t have the time to prepare any. As we approached the 15 mile marker I met a guy who was wearing a 100 marathon club vest & we briefly chatted about the race, he looked like he was in trouble and was slowing. He said he’d set off too fast, I said he should know better after 100+ marathons, we both laughed and I wished him well & carried on my way. I was now starting to catch the runners who had set off too fast at the start. The hills were starting to reduce some runners to a walk & I heard a few cursing as I ran passed. I could feel the heat from the road & decided it was a good idea to save some water for the latter stages. As I passed the aid stations I noticed they had no food at all, this always makes a marathon hard going as most runners need to re-fuel on the way round, I would rather have some proper food en route rather than a t-shirt I’ll probably never wear! I was now coming up-to the 20 mile marker and noticed how well the mile markers had been put out, every one seemed to coincide with my Forerunner which was quite unusual with my old Forerunner, the new one 310XT must be more accurate (review to follow). The road was now getting wider and we were on a main road with cars whizzing past. I could see a big hill in the distance which looked to go on for some time. I could also see people walking up it in the distance, little specks making their way to the top. I didn’t know it then but this hill went all the way to the finish with just one flat bit where it crossed a roundabout. I focused on the next runner to me and started to try and catch up to him. One by one I caught and passed about 10 runners who had tired on the hill, I’d been taking it easy up to this point so had plenty left for the last 6 miles. I slowly increased the pace until I felt I could sustain the effort until the end. I made it to the gates of the show ground which were maybe 150 yards from the finish and heard my club mates shouting for me to catch the next runner on, I started sprinting and passed him, heading for the finish. As I came to the finish line I heard the Tannoy announce my name & running club which I thought was a nice finish to a very enjoyable race. Every runner got a medal a bottle of water, banana and a space blanket. On the way back home I went for a dip in the sea to help recovery and we had a barbecue & run on the beach as the sunset. A great end to a very nice day!